It is absolutely freezing here in Brooklyn—a great vortex of bitter Arctic air has swirled south across huge swathes of the nation. The temperature here is 9° Fahrenheit (or -13° Celsius). Imagine how much worse things are in Minnesota, where it is -14° Fahrenheit (or -25° Celsius). Brrr! It hurts my fingers to write about it–even in my overheated study (well—bedroom, really). Now truly stretch your mind from the frozen heartland of America to the edge of the planetary solar system. 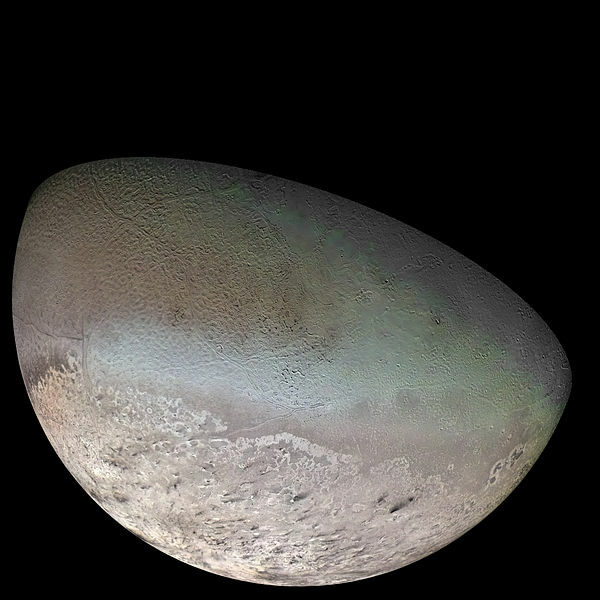 The largest moon of the ice giant Neptune is the moon Triton, discovered in 1846 by English astronomer/brewer William Lassell, and named for the son of Poseidon. On the surface of Triton temperatures plunge to 36…which is to say 36 K (Kelvin). To translate that is -237° Celsius or a bone chilling -395° Fahrenheit. Triton is a strange moon. It is the seventh largest moon in the solar system and it is the only large moon to orbit its planet in a direction opposite from the planet’s rotation (which is called a retrograde orbit). Since there is no model for retrograde moons forming from accretion disks, Triton must be a captured object from the Oort cloud—and, indeed, the moon is extremely similar in composition to Pluto and other dwarf planets of the Solar system’s distant periphery. 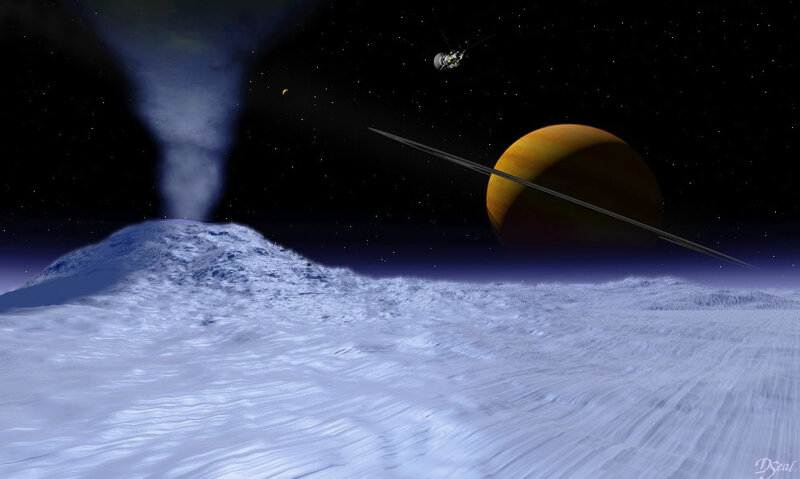 Despite the extreme cold of Triton’s surface, the moon is geologically active. 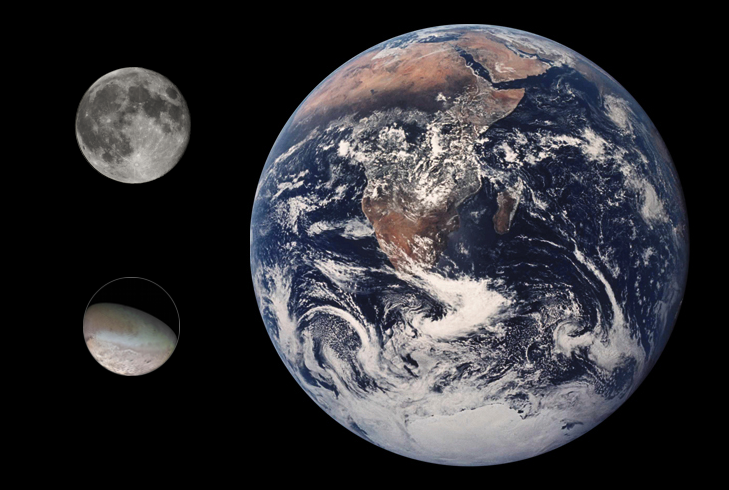 Like Earth, the moon is probably differentiated into layers: a core, a mantle, and a crust. The crust is formed of ice: frozen water, methane, and nitrogen. A large polar cap covers the southern pole, but much of the rest of the moon is a“cantaloupe” surface of melted and refrozen ice. The surface is (geologically) young. Cryovolcanic activity and tidal forces have kept the ice active. Cryovolcanoes were first spotted on Triton during the Voyager 2 flyby in 1989 (the first time such phenomenon were ever observed). Because of tidal warming (caused by gravitational interaction with Neptune), Triton may have once had a liquid ocean beneath the crust, but this has likely solidified assuming that there is no radioactive decay from the rocky core. Triton is closer to Neptune than the Earth’s moon is to Earth…and Neptune is seventeen times more massive than Earth. This doesn’t bode well for the long term future of Triton. Within the next three and a half billion years, the moon will either be pulled into Neptune’s surface and swallowed or it will be ripped to pieces and form a spectacular ring structure like Saturn’s.